Infinity War villain Thanos is coming to San Diego Comic-Con in LEGO form. Marvel Studios is skipping out on the massive pop culture event this year. When Marvel does bring a showcase, it tends to be the highlight of the entire weekend. Unfortunately, the grounds of Hall H will not be graced by footage of Avengers 4 or Captain Marvel this year. However, Marvel is still going to have a big presence on the floor at SDCC 2018 as this life-size version of the Mad Titan will be on display. 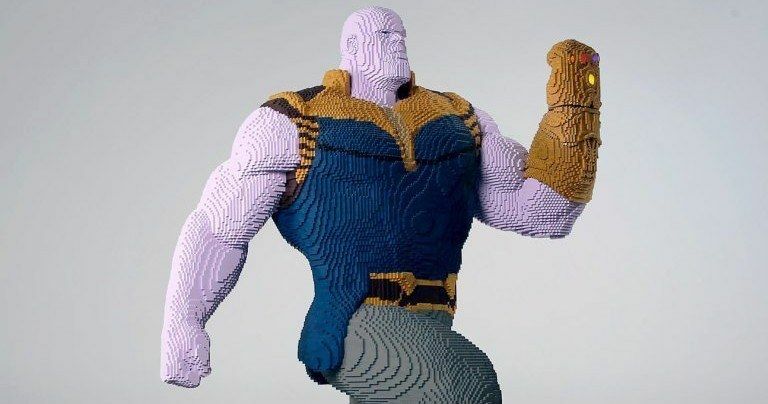 The massive Thanos LEGO creation looks absolutely stunning even in just the couple of photos that have been released online. One can only imagine how much more impressive it will look up close and in person on the Comic-Con floor later this week. The life-size recreation of the Marvel villain is comprised of 91,350 bricks and weighs about 450 lbs, standing at eight-and-a-half feet tall. LEGO Master Builders spent 418 hours, more than 17 days worth of time, bringing it to life. It looks to have been time well spent. LEGO is set to have a massive presence at San Diego Comic-Con this year. In addition to the life-size Thanos, they are also going to have other life-size characters on display at their booth, as well as a play area and a host of convention exclusives. LEGO has a 197-piece Aquaman set, which is inspired by the 1960s cartoon and not the movie, a Giant-Man and Wasp set from Ant-Man and the Wasp and a Millennium Falcon cockpit set from Solo: A Star Wars Story. There are also going to be mini flags for Black Lightning, Unikitty and, last but not least, Sheriff Deadpool. So bring some cash with you while checking out Thanos. For LEGO, it makes perfect sense to have Thanos at the center of their display this year. Not only does it look incredible, but the giant purple bad guy is at the heart of one of the biggest movies of all time now, thanks to the tremendous success of Avengers: Infinity War at the box office. The massive Marvel flick, which stars Josh Brolin as the Mad Titan, has grossed more than $2 billion at the box office. That makes Thanos a genuine pop culture figure on a global scale and not just one of the most fearsome villains in the pages of Marvel Comics. San Diego Comic-Con 2018 kicks off this Wednesday with preview night and runs through Sunday. We're sure to get plenty of reveals, trailers and news leading up to and throughout the event. This awesome Thanos is just the tip of the iceberg. We'll be sure to keep you up to date with everything as it comes our way. For now, be sure to check out some photos of the life-size LEGO Thanos, courtesy of The Hollywood Reporter, for yourself below.